The latest version of Microsoft's operating system improves the Start menu, lets you control updates, and makes some interesting improvements. 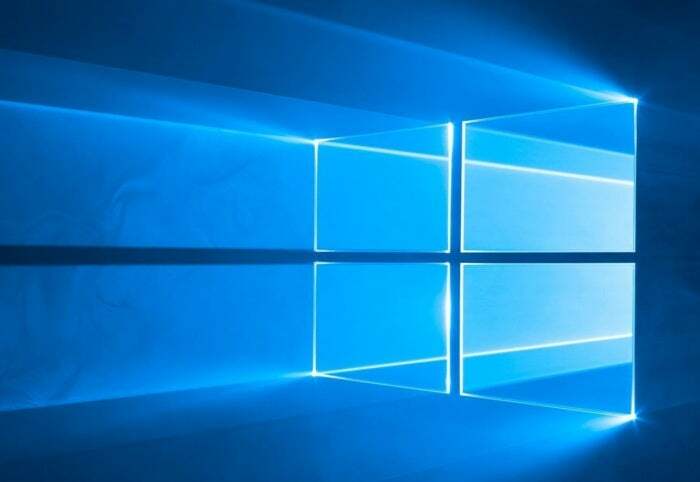 Windows 10 Creators Update, the first major update to Microsoft's operating system since last summer's Windows 10 Anniversary Update, is finally here. As always, Microsoft will make much of its new version -- to the point that it's announced that impatient users can download the Creators Update today, a week before the official April 11th roll-out date. But is it as big a deal as Microsoft wants you to believe? Or is it much ado about nothing? I've been using the Creators Update in its various builds for months, and have put the final version through its paces. Here's the lowdown. One note before I begin: Ignore the name "Creators Update." This newest upgrade to Windows 10 has very little to do with creating things apart from a few relatively minor features that I'll describe later. 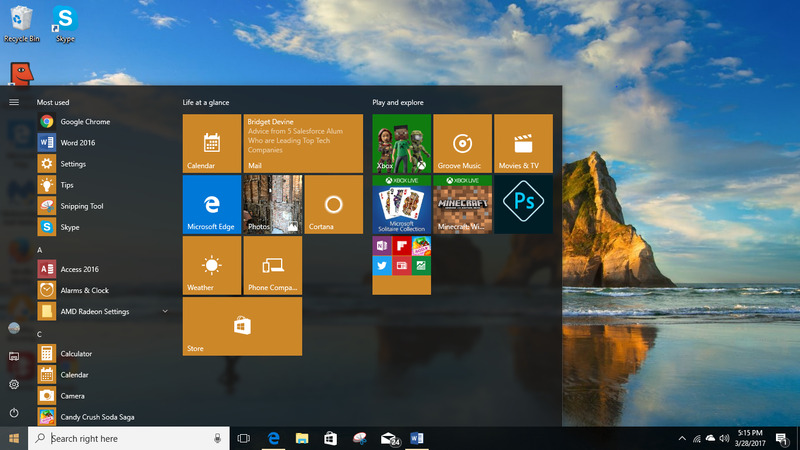 In fact, the only significant interface change in the Creators Update has to do with the Start menu -- and even then, it's not particularly noticeable at first glance. But if you're a fan of the Start menu and you use it to run applications, you'll find this update extremely useful, because it helps clean up some of the clutter. With the Creators Update, you can now place multiple tiles into a folder on the Start menu. It's simple: You just drag one tile onto another. This automatically creates a folder with both tiles inside it. You can then drag any other tiles you want into the folder. Folders look like tiles and display small thumbnail icons of all the apps they contain. Click a folder and it opens, with each app appearing as an individual tile. You can then click any tile to run the app. Click the folder again and all the tiles slide back inside. You can now create folders in the Start menu, each of which can contain tiles for multiple apps (see the third tile down in the "Play and explore" section). You can resize the folder tile if you need to by right-clicking it and selecting Small, Medium, Wide or Large. But although this changes the size of the folder tile, the icon thumbnails inside don't change -- they stay small no matter how large you make the folder tile. You simply see more thumbnails. How useful you'll find these folders depends on how much you rely on the Start menu to run applications and how many applications you run. In my case, I pin my most-used applications to the taskbar and run them from there; otherwise, I type the apps' names into Cortana and run them that way. Because I rarely rely on the Start menu to run applications, this feature is a nice-to-have rather than a must-have for me. Your mileage may vary. I do have a small nit to pick with the way the feature is designed. Other tiles on the Start menu have text labels underneath them -- Mail, Calendar, Microsoft Edge and so on. But folders don't, which makes it hard for you to identify the purpose of each folder and what's in it. You have to peer closely at its small thumbnails to figure out what's in each. It would have been much better if Microsoft let you label each folder. Many people have complained about the unyielding way that Windows updates itself -- you can't bypass an update, and you have to do it on a schedule set by Microsoft. In the Creators Update you get some control over the process, depending on which version of Windows you use. Windows Home users get less flexibility than those with Windows Pro, Windows Enterprise or Windows Education editions. Home users will no longer be blindsided when Windows interrupts their work to do an update. They'll be notified when an update is available, and given the option of either installing it immediately, scheduling it for a specific time or putting it off by clicking "Snooze." 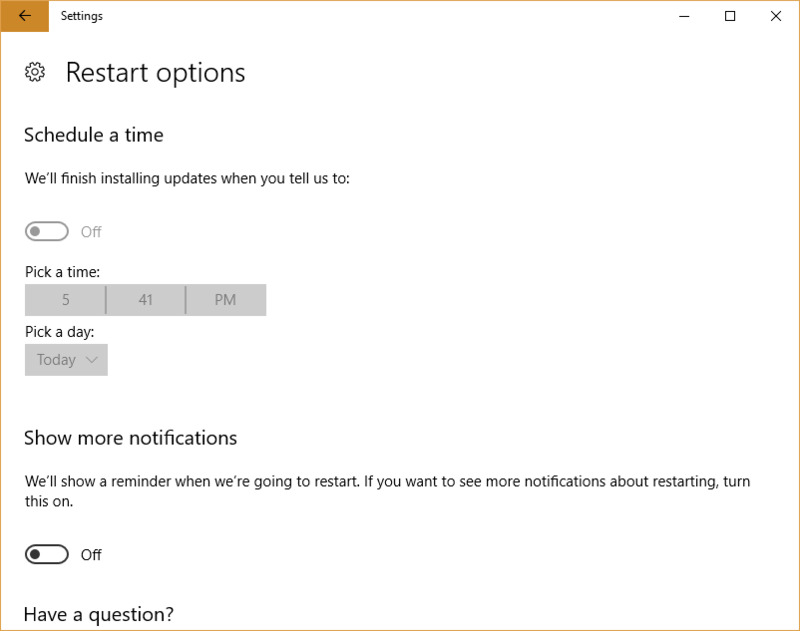 Users now get an alert when an update is available and have the choice of installing it immediately, choosing a specific time or putting it off by clicking "Snooze." Clicking "Pick a time" brings up a dialog box that lets you schedule the precise day and time the update runs. Clicking Snooze puts off the update for three days. Three days later another notification appears with the same three options. If you want, you can click Snooze again. You can keep doing this to indefinitely put off the update. When you pick a time to update, you can now choose a specific day and time. Users with Windows Pro, Windows Enterprise or Windows Education editions have much more control over how Windows updates. Before, users who wanted to delay their cumulative updates had to use a complicated workaround that required changing several settings and using either the Group Policy Editor or Registry Editor. They could delay "feature updates" (which add new features to Windows) by up to 180 days. With the Creators Update, users can now automatically delay cumulative monthly updates for up to 30 days, and can delay feature updates by up to 365 days. The latest figures from NetMarketShare show the Microsoft Edge browser with a market share of under 6%, far behind Chrome, which has more than 58%, and even Microsoft's legacy browser, Internet Explorer, which has nearly 19%. So with every Windows upgrade, Microsoft spends considerable time improving Edge in hopes of closing the gap with Chrome and weaning users off IE. The Creators Update is no different. For a start, Flash is now disabled in Edge by default, although you're given the option of allowing it on a site-by-site basis, either on a one-time basis or permanently. (In the previous version of Edge, only non-essential Flash content, like advertising, was blocked.) Microsoft is disabling Flash to improve security, performance and battery life. 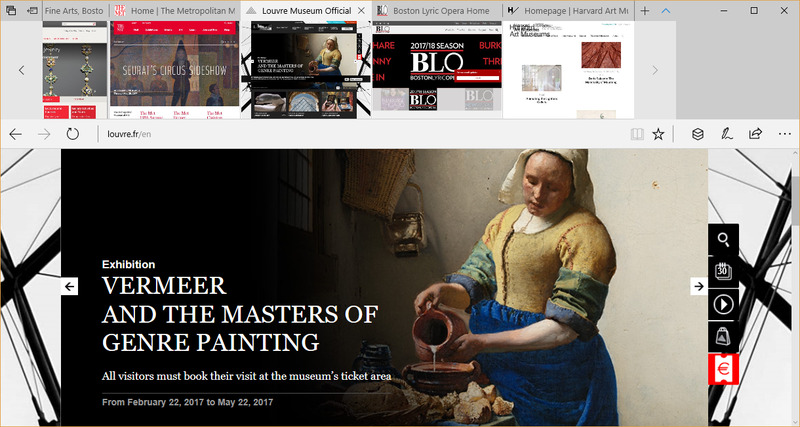 When a website also uses HTML5 to deliver ads or other multimedia content, Edge uses HTML5 instead of Flash. 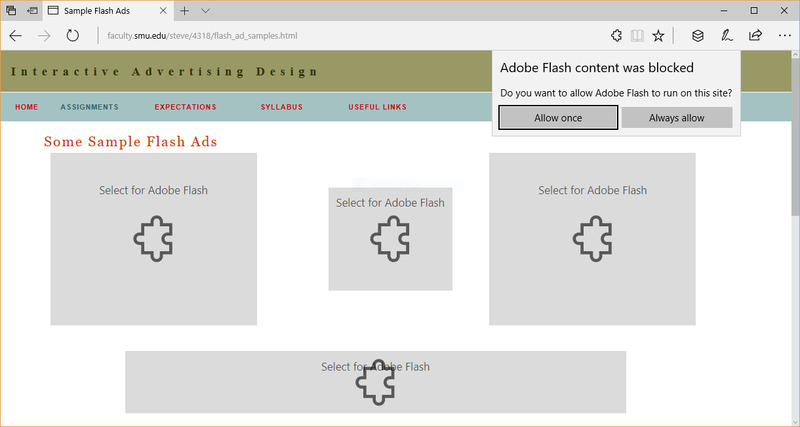 Microsoft Edge now blocks Flash content, although you have the option to run it when you want, on a site-by-site basis. Perhaps more important than blocking Flash is the addition of some very useful tab-handling features. If you've ever been frustrated by not being able to quickly locate the tab you want to switch to, you'll appreciate this. You can see a thumbnail of every open tab by clicking a down arrow to the right of the Add Tab button at the top of the screen. That lets you quickly scan all the currently open sites. Click the thumbnail of the tab you want to switch to, and you get sent immediately to that tab. I frequently keep many tabs open, and I found this feature a great help in getting me fast to the tab I wanted to find. Over the course of a day of browsing, I found it a tremendous time-saver. Microsoft Edge’s most useful new feature is the ability to see thumbnails of all open tabs. Should you decide to close all your open tabs, but think you might want to revisit them later, click a button to their left to put them aside as a group. When you want to open the group again, click a button to the left of that one, and they all open. You can recall the tab group even after you've closed Edge -- in fact, even after you've logged out of Windows. What makes this feature even more useful is that you can do this to multiple groups of tabs. For example, over the course of several hours I visited several museum websites, news sites, and sites with medical information. I grouped and closed each session, and was able to easily revisit them later. However, while this is a useful feature, it does feel like a first step. It would be much more useful if you could label each group -- for example, Museums, News and Medical -- and add and remove tabs once a group was created. 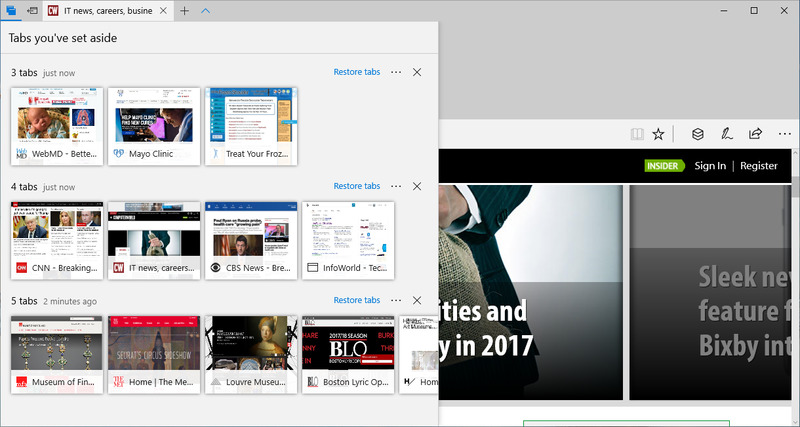 With the new Edge, you can reopen groups of tabs you’ve previously visited. Also new in Edge is that you can read books and other content in ePub and PDF formats. Edge will also read their text aloud. This includes the usual e-reading features, such as the ability to continue reading where you had previously left off, change text size and so on. There are a variety of other improvements to Edge, including the ability to play Netflix at 4K resolution, under-the-hood security improvements, and being able to import favorites from other browsers. However, one of Edge's biggest drawbacks -- a serious lack of extensions -- hasn't been fixed. Only 25 are available, compared to the tens of thousands available for Chrome. Microsoft says that it has released more extension APIs for developers and is working with developers to get more extensions built. But it's been about eight months since Edge was given the ability to use extensions, and Microsoft has only managed to get 25 of them written. It looks unlikely that Edge will ever come remotely close to competing with Chrome in this arena. The upshot? Despite some improvements, Edge is still not a particularly compelling browser, and this latest iteration is not likely to convince many people to switch from Chrome or any other browser. Microsoft is betting big on virtual reality and 3D. In fact, 3D and virtual reality are likely the reasons Microsoft calls this version Creators Update. With the update, Windows 10 can run HoloLens virtual reality and mixed reality apps for the first time. Additionally, Microsoft is highlighting a variety of hardware devices in concert with the OS update. Microsoft is also hoping that you'll be a creator -- not just a consumer -- of 3D content, so the update includes the Paint 3D app. (The original Paint is included as well.) The app includes a variety of tools for creating 3D drawings, including 3D objects, brush tools, text, effects and more. Even if you're not an artist or have no artistic talent (like me), you'll be able to easily create and edit 3D objects, by starting off with models and objects included in the app. You can even doodle in 3D -- use a mouse or compatible pen to draw, and the program converts your doodle into a 3D object. 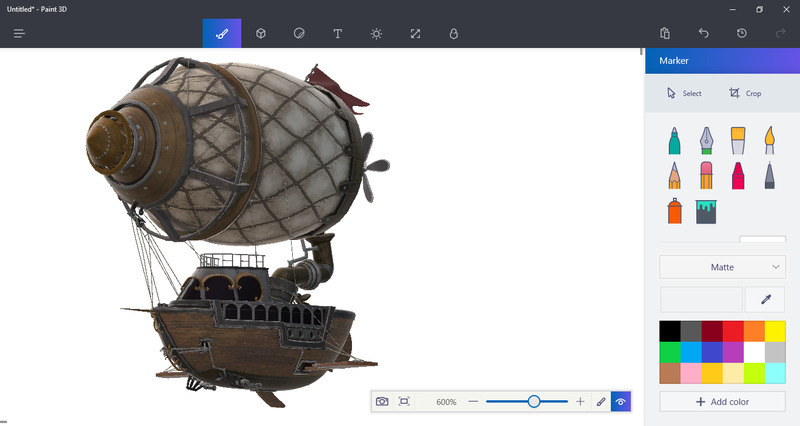 Paint 3D lets you create 3D objects. Better still, join Microsoft's Remix3D.com community, which has many 3D objects and models built by other Paint 3D users. You can browse and import them from right within Paint 3D, and then customize them. You can upload your creations to the community as well.